Altergy’s fuel cells provide extended runtimes and cost less than VRLA batteries. They weigh less, too, so they can be deployed almost anywhere. Altergy’s modular design delivers the right amount of power when and where you need it, for as long as you need. 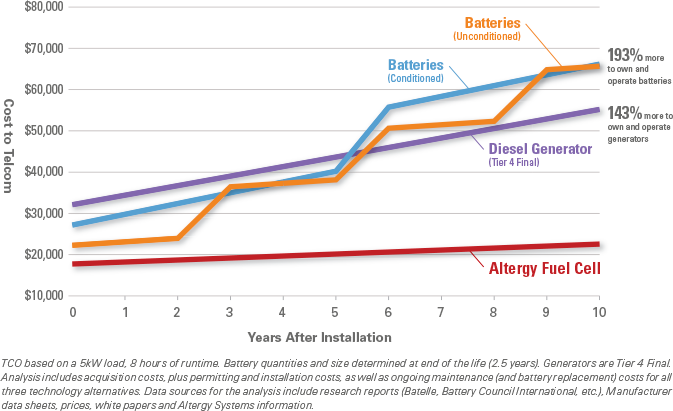 Altergy fuel cells have lower CapEx costs, ongoing maintenance costs, and total cost of ownership than batteries. Altergy fuel cells weigh a fraction of VRLA batteries, take up less space, and are ideal for rooftop installation. Altergy fuel cells can provide longer runtimes in smaller spaces than batteries. Batteries tend to be replaced every three-to-five years, can have significant impacts on landfills, and must be disposed of through a heavily regulated process; fuel cells produce clean power and have a design life of more than 15 years. Heat, other environmental conditions, and discharge cycle rates can decrease battery performance and lifespan; Altergy fuel cells maintain their performance in extreme hot or cold temperatures and have provided uninterrupted power where legacy systems have failed. Batteries typically deliver up to four hours of performance, insufficient runtimes to adequately back-up critical systems; Altergy fuel cells can provide several hours, or several months, of continuous operation. Batteries require constant monitoring and field maintenance conducted by skilled technicians; the primary maintenance required for Altergy fuel cells is replacing air filters once a year.